Anyone remember the DROID INCREDIBLE? This phone was released through Verizon and was very popular at launch. The phone was so popular that supply couldn't keep up with demand. The Incredible finally has caught up and has inventory available for sale. That was the good news. 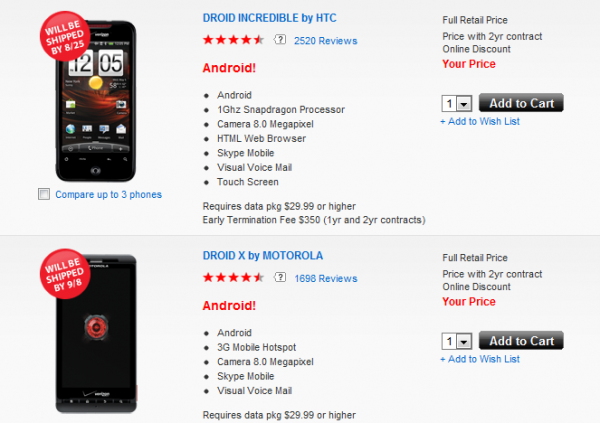 The bad news is that the Droid X, the best selling Droid yet, is not available for sale. In fact, the shipping date for this phone is now being pushed back to 9/8. This still doesn't beat the wait times that buyers had for the Incredible though. Verizon has still not updated either of these phones to 2.2 yet. What is the hold up? The Droid and the Droid 2 both have 2.2. I understand that sometimes this takes time for programmers to make this work, but if it can be done on phones with similiar specs already, then why can't these phones have it already. The latest and greatest hardware needs the latest and greatest software and OS. Who's with me?